Earth will be farthest from the sun on the 4th. Pluto is at opposition the same day. At the start of July, a waxing crescent moon is just a little north of the equator heading south. In the early morning hours of the 5th, some viewers in South America will see the moon pass in front of Mars. 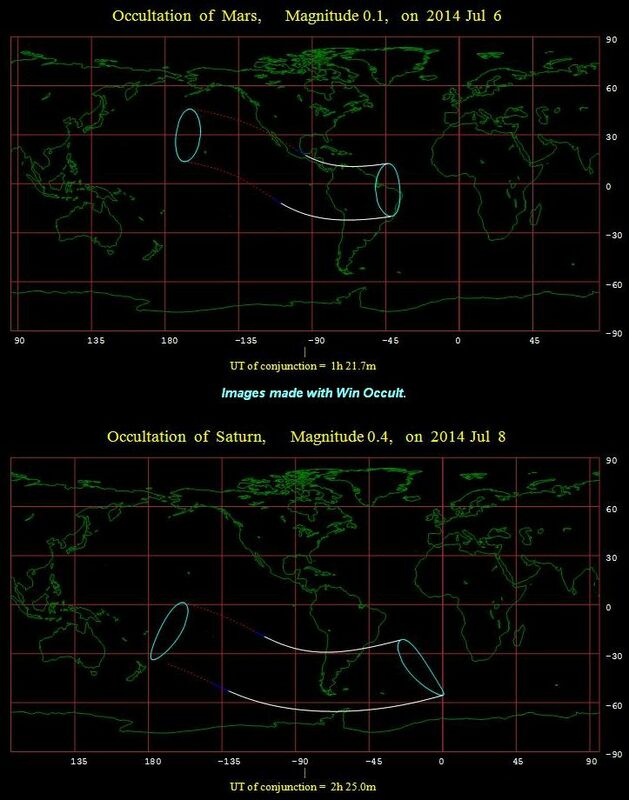 Viewers in other places in South America will see the moon pass in front of Saturn on the morning of the 8th. In the time between, on the 6th, the moon will pass by the bright star Spica. The moon will be its farthest south for the month on the 10th. Then it will be full on the 12th. Also on the 12th, Mercury will reach greatest elongation west of the sun. At 20.9° from the sun, it will not be at its easiest to see, but it won’t be at its hardest either. The messenger planet will be at perihelion on the 29th, still in the morning sky. Some people will call this month’s full moon a “supermoon” because lunar perigee occurs the day after on the 13th. The moon reaches its farthest north on the 23rd and is close to Venus in the morning sky the next day. Lunar apogee is on the 28th. On the last day of the month, the moon is on the equator heading south again. Mars will be 1.3° from Spica on the 14th. The Southern Delta Aquarids meteor shower peaks around the 28th. The best views will usually be from the east after midnight. That’s around the time of the new moon, so moonlight won’t spoil the view. July 16th marks the 20th anniversary of Comet Shoemaker-Levy 9 striking Jupiter. The comet had broken into multiple pieces. Each fell into the big planet, one after another, just a little beyond the visible side of the planet’s disk. 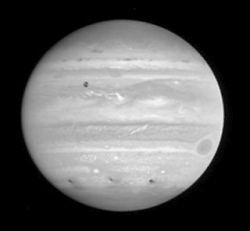 Telescopes all over Earth and a few above it were pointed at Jupiter as temporary holes punched in the planet’s cloud bands orbited into view. Jupiter passes on the other side of the sun on the 24th. Two days later, the moon will be close by. But both will be too close to the sun to see this conjunction. The first and fourth asteroids ever discovered will be just 0.2° apart from each other in Virgo on the 5th. Their respective names are Ceres and Vesta.